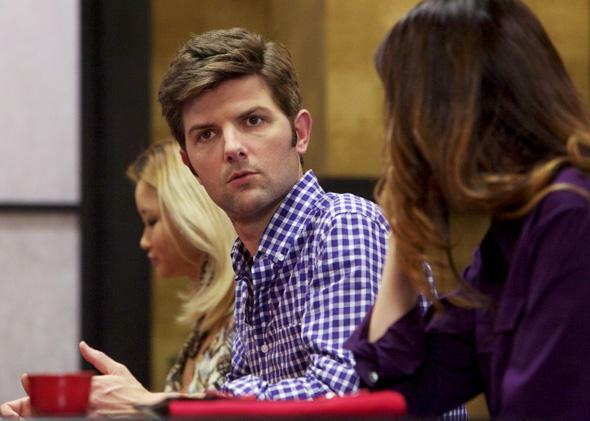 A.C.O.D., starring Adam Scott, reviewed. A good comedy about bad parents. A.C.O.D.—the unfortunate title is an acronym for Adult Children of Divorce—is the debut feature of writer-director Stuart Zicherman, who seems to be working at least in part from autobiographical material as he tells the story of Carter (Parks and Recreation’s Adam Scott), a successful young restaurateur who’s spent his life dodging the fallout from his parents’ acrimonious divorce. There’s an undertone of score-settling to this not-so-romantic comedy, a bitterness that’s sometimes unpleasant and sometimes wickedly funny. For all its inconsistency of tone, A.C.O.D. tries, and often succeeds, at things few contemporary comedies do. For one thing, instead of making the relationship between parents and their grown children into a subplot subordinate to the main love story, Zicherman does the reverse. When Carter’s little brother (the endearing Clarke Duke) gets engaged, it’s the run-up to the wedding that’s the B plot. The main story involves Carter’s attempts to corral his two horrific parents in a room long enough to inform them that, as God is his witness, they will behave civilly for the length of the festivities. Hugh (Richard Jenkins) and Melissa (Catherine O’Hara) haven’t spoken in 20 years, except through the lawyers they’ve hired to hound each other. Hugh is a serial marrier of much younger blondes (the most recent played by Amy Poehler, a curious casting choice given that her character gets almost no jokes at all). Melissa has sustained a longer marriage to the infinitely patient Gary (Ken Howard), but she still flies into a rage at any mention of her ex-husband. As an opening flashback involving a ruined birthday party makes clear, these two did about the worst job a parent can (short of outright abuse or neglect), making their older son the go-between in their competitive infidelities and other self-serving behavior. Twenty years of estrangement haven’t resulted in any measurable spiritual growth: After Carter finally forces them to have dinner together, his parents start a very poorly concealed affair with, of all people, each other, once again using their son to cover up for their lies. Zicherman leans a little too heavily on the Oedipal slapstick inherent in this setup: There are only so many times we can flinch at the scenario of a man surprising his parents in flagrante delicto, or cringe at a mother who teasingly wonders whether passersby will mistake her son for her “boytoy.” But the fact that Carter’s monstrous progenitors are played by Richard Jenkins and Catherine O’Hara is perhaps the main reason to watch A.C.O.D. Though their roles are sometimes underwritten—especially O’Hara’s, given the comic and dramatic range she’s capable of—these two veteran character actors collaborate to create a convincingly toxic couple. They loathe each other because they love each other; you can see the way they anticipate and exploit each other’s weaknesses, and how completely oblivious they are to the effect of their behavior on everyone else on the planet. O’Hara and Jenkins never seek the audience’s sympathy on their characters’ behalf, but we wind up begrudgingly allowing them some anyway. Melissa and Hugh are dreadful exemplars of humanity, but as with one’s own family members, what are you gonna do? The sheer size of O’Hara’s and Jenkins’ characters occasionally threatens to overwhelm the more subdued performance of the dryly quizzical Scott—but maybe that’s fitting in a movie about a glum introvert buffeted about by two expansive narcissists. In a subplot that takes up a little more time than it needed to, Carter visits his childhood therapist (played by the reliably amusing Jane Lynch), who turns out to be something of a sneaky manipulator herself. And in an even less necessary subplot—albeit one that makes for a single great scene—the commitment-averse Carter tries to work up the nerve to propose to his girlfriend (Mary Elizabeth Winstead), who had to date him for four years before even getting a key to his apartment. There’s also, for some reason, a completely unnecessary sub-subplot about Carter’s flirtation with a fellow A.C.O.D., played with her usual lack of vigor by Jessica Alba. Scene for scene, Zicherman and his co-screenwriter Ben Karlin can write quick-witted dialogue, but they tried to cram way too much story into this slim 87-minute movie. The last act, in which most of the principals converge on the family’s old summer house for a celebration-turned-confrontation, strains too hard for a tone of farce that doesn’t quite suit the film. But the very last scene—in which an unrepentantly awful Hugh regales his about-to-be-married son with a charming anecdote about his night in a Portuguese whorehouse—hits a bittersweet note of acceptance that left me glad I saw this alternately wise and resentful comic memoir. Yes, Dad was a jerk at the wedding, but at least he was there.